Unique Bachelor and Bachelorette Parties: Forget Vegas! Other than prom, your bachelor/bachelorette party is supposed to be the single most epic night of your life with your closest friends. No pressure, right? Everyone wants to plan an event of Vegas-style proportions, but it can be a headache trying to get your entire party on board. Instead of debating which club to go to or the cost of flights, get your crew together for an unconventional night that’s sure to take care of any pre-wedding jitters (or better yet, let out the aggression that comes from planning a wedding). 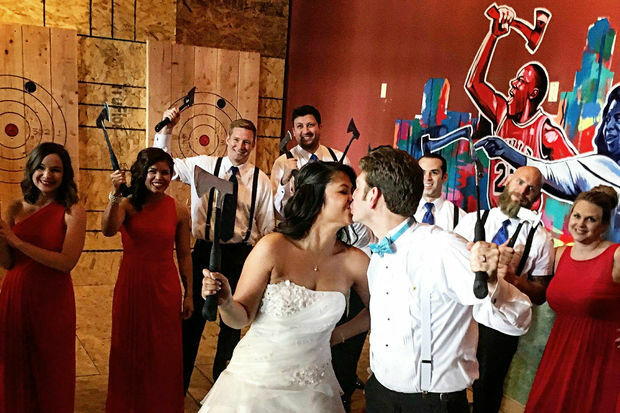 Bad Axe Throwing provides the perfect venue to celebrate your impending nuptials with real edge. Break away from the traditional super feminine party or, conform to the uber masculine stereotype with an activity that will get your heart racing for all the right reasons (just like your partner-to-be). Like the bridesmaid dress or tux that perfectly fits all shapes and sizes, axe throwing is your all-inclusive sport packed with thrills and excitement. Anyone with hands can do it and anyone who enjoys fun will. No matter the age or skill level, it’s an accessible activity for your best friend, brother, sister and third cousin. Simply put: no one will be left out and everyone will enjoy a night to truly let loose. TripAdvisor ranked Bad Axe Throwing #1 in Fun and Games in Toronto. We know not everyone is from Toronto, but that’s a solid record we intend on securing for our locations across Canada (and now the U.S.). We’re so passionate about parties that we take them as seriously as how we sharpen our axes: with immense care. Your group with be taken care of from start to finish and we promise each guest will leave with enough photos to bribe you later on in life. 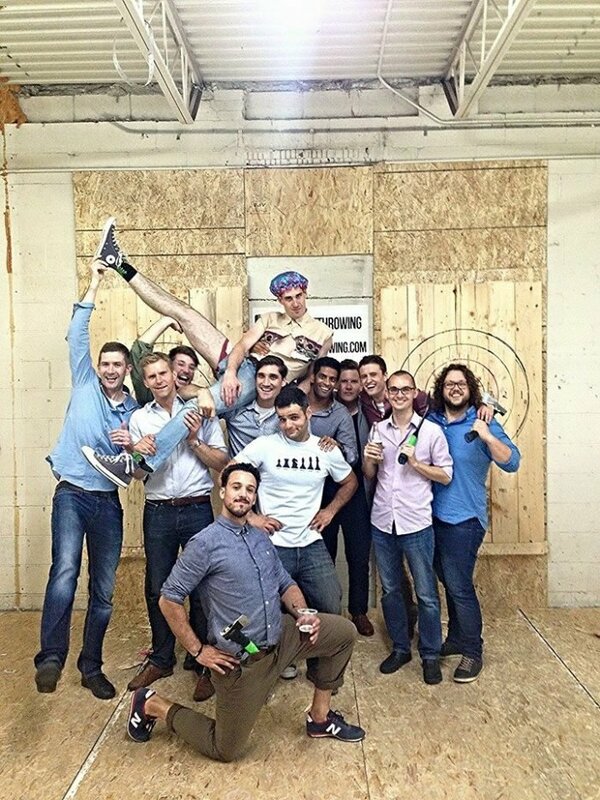 For your axe throwing bachelor or bachelorette party, you’ll get a private lane to practice and throw for only you and your guests. 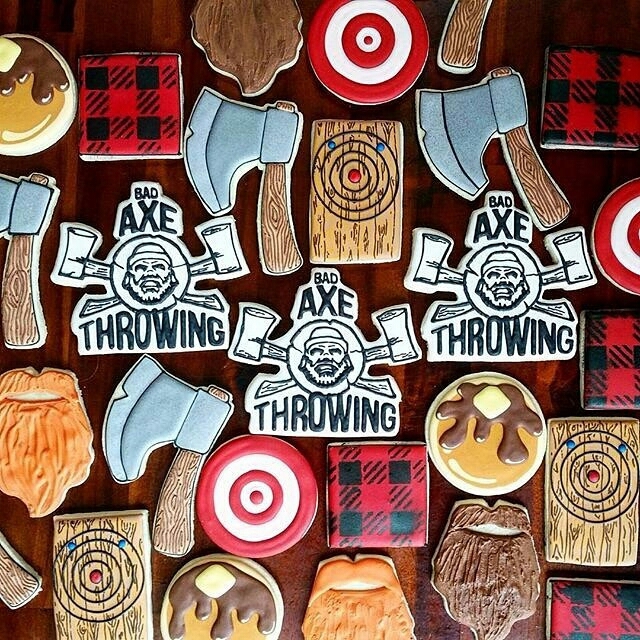 Bad Axe Throwing also allows you to bring your favourite party snacks, drinks and even cake. If you’d like catered food, we can provide you with a list of local vendors who serve up only top-notch fare. Tables and a fridge are provided for you to eat and keep it all extra fresh. Who doesn’t want to enjoy a cold brew in between axe throws? It’s the lumberjack and lumberjill way. 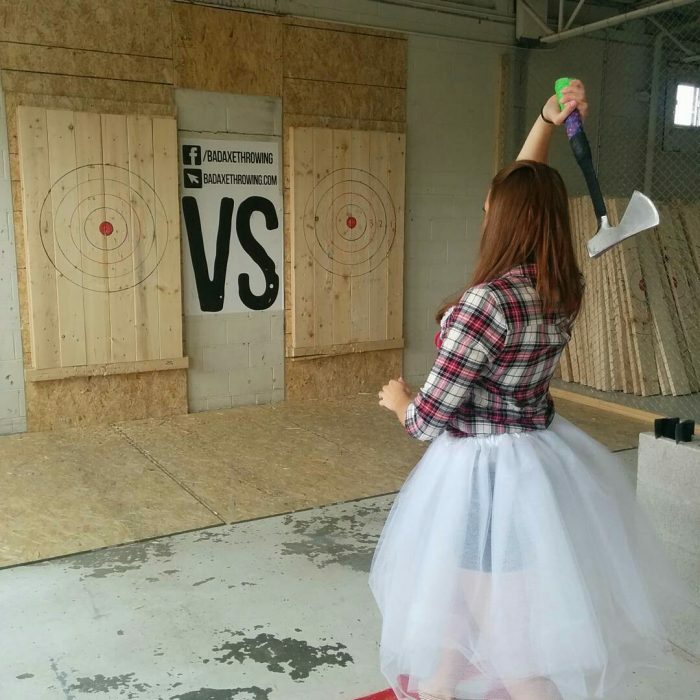 Some may think it’s not the smartest idea for a bride or groom to throw axes mere days before they tie the knot. What if they get hurt? The wedding photos will be ruined! Not quite! Fortunately for us, there’s a greater risk of injury if you went out to a bar than to Bad Axe Throwing. We have a stellar safety record and in fact, the blades are not sharp to the touch. Our expert coaches will train your group on everything safety while keeping a hawk-eye out for anyone not following the rules. They’ll also provide the guidance you’ll need to perfect your technique and show off to your party or impress your new wife or husband later! This event should be one of the most incredible of your life (aside from your actual wedding night). We promise to deliver in every area—from fun and excitement to thrills and life-long memories. It’s our guarantee. We are the axe-throwing and party-throwing experts. Ready to add edge to your bachelor or bachelorette party? Click to Book your bachelor or bachelorette party today! Do you have a location in Ottawa Ontario? If yes info on location and contact information please. Thanks so much and look forward to having you in!